A cold front that pushed through overnight has left the airport under a thin blanket of new snow, but the sun is shining and cleanup operations are well underway. There should be no problem heading out on today's dual cross-country, you inform your instructor by phone. He's glad to hear it, but has a question: "Any FICONS of interest this morning?" Especially in northern regions, 'tis the season when FICONs—a notam contraction that translates to "field conditions"—should become a routine item to check during preflight briefings. This FICON notam was briefly in effect at St. Cloud Regional Airport in Minnesota after an early November storm barreled through the upper Midwest: "TWY ALL FICON PATCHY COMPACTED SN BA FAIR OBSERVED AT 1411120300. 12 NOV 03:06 2014 UNTIL 12 NOV 23:00 2014. CREATED: 12 NOV 03:08 2014." This notam was one of several recently in effect in Gulkana, Alaska: "RWY 15/33 FICON ICE AND THIN SN OBSERVED AT 1411070025. 07 NOV 00:25 2014 UNTIL 13 NOV 09:00 2014 ESTIMATED. CREATED: 07 NOV 00:44 2014." Notice that the St. Cloud notam described snow as patchy and compacted, and the notam ended with "BA fair"—a report of fair braking action. "When tower controllers have received runway braking action reports which include the terms 'fair,' 'poor,' or 'nil,' or whenever weather conditions are conducive to deteriorating or rapidly changing runway braking conditions, the tower will include on the ATIS broadcast the statement, 'Braking action advisories are in effect,'" explains the Pilot/Controller Glossary section of the Aeronautical Information Manual. Note the abbreviation TWY that precedes the notam in St. Cloud, and RWY, preceding the Gulkana notam. 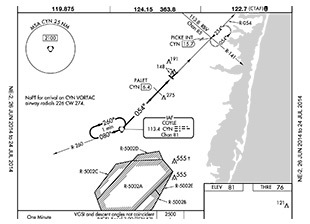 The abbreviations, for taxiway and runway, respectively, are notam D keywords that appear in the AIM's table 5-1-1. A keyword must appear as the first part of the notam's text after the location identifier (in these cases, the airport identifiers). The format of notams about field conditions was revised in 2013 so that "during periods when field conditions are not being reported, a FICON notam may be originated for a pilot-reported condition, with the words 'pilot reported' preceding FICON. The notam’s expiration time must not exceed 12 hours." The AIM also advises pilots to be prepared to give controllers "a descriptive runway condition report" after landing, when braking advisories are active. Did you know that student pilots who join AOPA are three times more likely to complete their flight training? Membership includes unlimited access to aviation information by phone (800/USA-AOPA, weekdays from 8:30 a.m. to 8 p.m. Eastern time) or from Flight Training Online or AOPA Online. If you're not already a member, join today and get the pilot's edge. Commercial Aviation Corp. of China, known as Comac, announced at the recent Airshow China a deal to build 30 C919 170-passenger jets for the leasing arm of the state-owned China Merchants Bank, according to The New York Times. Comac, also state owned, displayed its ARJ21 regional jet and C919 jetliner at the show, according to the newspaper. Forbes reported another announcement from the show, the order of 20 Y-12 19-seat turboprops. California-based Coptervision ordered the aircraft, which is produced by Aviation Industry Corp. of China, also an investor in Comac. Trans States Airlines announced Nov. 10 that it will operate 36 Embraer E145 aircraft provided by United Airlines. The airline, which has been providing regional service for United Airlines under the United Express brand since 2003, plans to begin taking delivery and starting scheduled service with the new aircraft under that brand in February 2015. Deliveries are expected to continue through the first quarter of 2016. For more aviation career news, see the Flight Training website. They're coming. 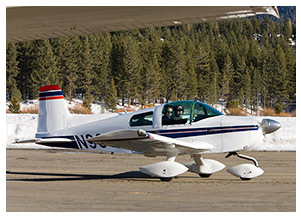 As trainers and privately owned aircraft, the numbers are increasing of a "double-seated," low-wing, canopied light sport aircraft identifiable by its distinctive wing tips and three-bladed propeller. 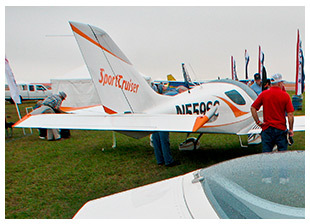 Spotters will recognize the aircraft as a SportCruiser from Czech Sport Aircraft; if a spotter refers to it as a PiperSport, that's a dated reference to Piper's brief project to market the aircraft as its own branded LSA. Czech Sport Aircraft estimates that there are more than 200 SportCruisers operating in the United States, and recently announced that more are on the way. The DME has been acting up on today's flight. Now it's doing it again. You'll have to pinpoint fixes along the approach course using the ADF. Ready for the challenge? What is the difference between deice and anti-ice systems? Ever dream of turning your passion for aviation into a career? We're looking for a coordinator for pilot community development, program manager for flight training initiatives, senior advertising sales account executive, senior financial analyst, digital marketing manager, major gift officer, senior ambassador, ambassador for Southern California, .Net applications developer, social media evangelist, legal services plan program manager, and account manager II. To learn more about other AOPA career opportunities, visit AOPA Online. Want something to do this weekend? Planning an aviation getaway? See AOPA's enhanced calendar of events. Now you can filter events by date range, airport ID, state, or region. Before you take off on an adventure, make sure you check our current aviation weather provided by Jeppesen.